As part of a project with wombat's hostels, I've been exploring the area around the fantastic location of their Budapest hostel. As I come out of my accommodation at wombat’s City Hostel and into Budapest’s Jewish Quarter, there’s a large mural on a wall. 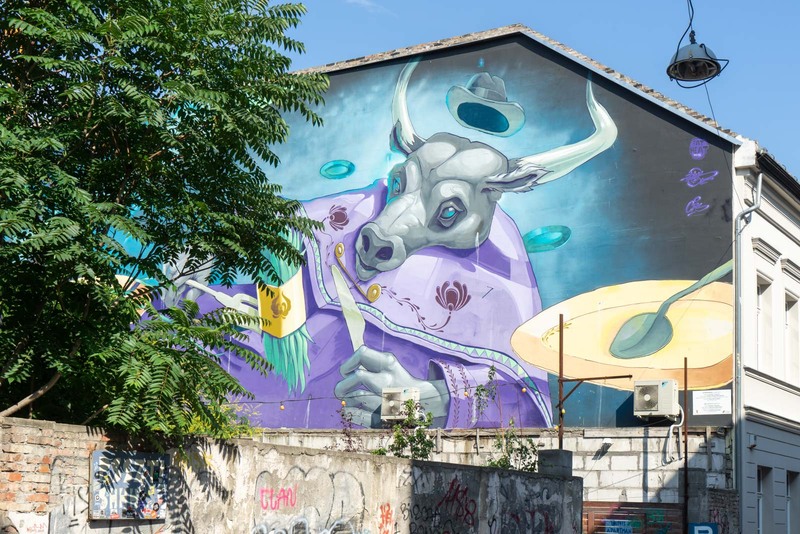 This isn’t unusual – there’s a lot of street art in this part of Budapest. What makes this one so interesting is that it captures what I’m about to see for myself. It’s called ‘Sunrise or Sunset on Kazinczy Street’ and, not surprisingly, is at the top of Kazinczy Street. 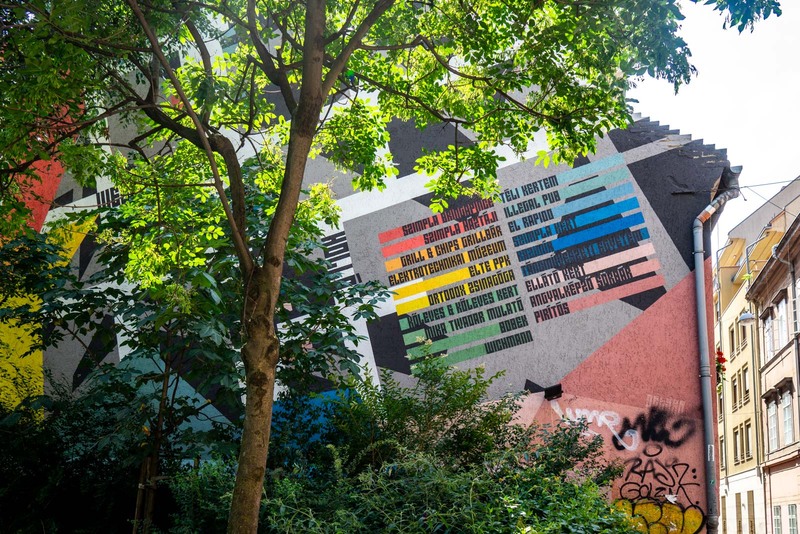 The mural lists some of the things that you can do along the street – bars and clubs, for instance. But it also makes note of landmarks like a synagogue and a dance academy. It’s this contrast between the old and the new, the blending of generations, that I find so fascinating about the Jewish Quarter here. 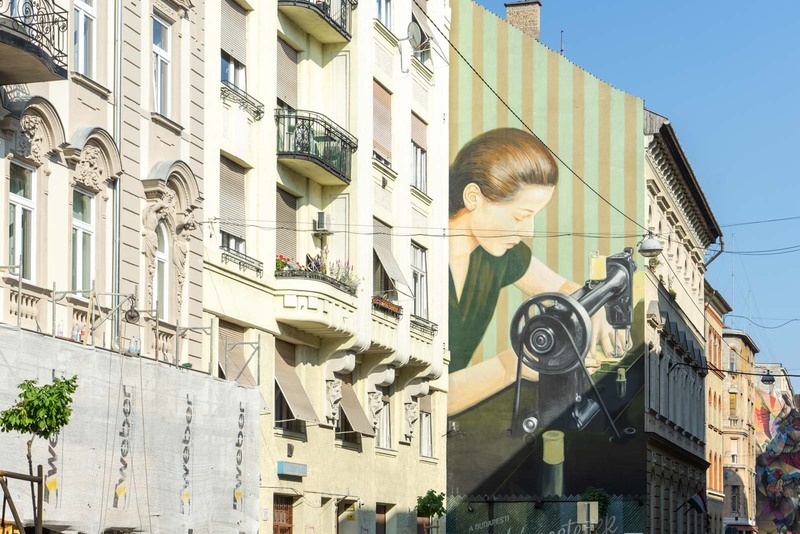 This may now be the heart of Budapest’s party district, but it has a long and fascinating history that’s become intertwined with the gentrification that’s taking place. 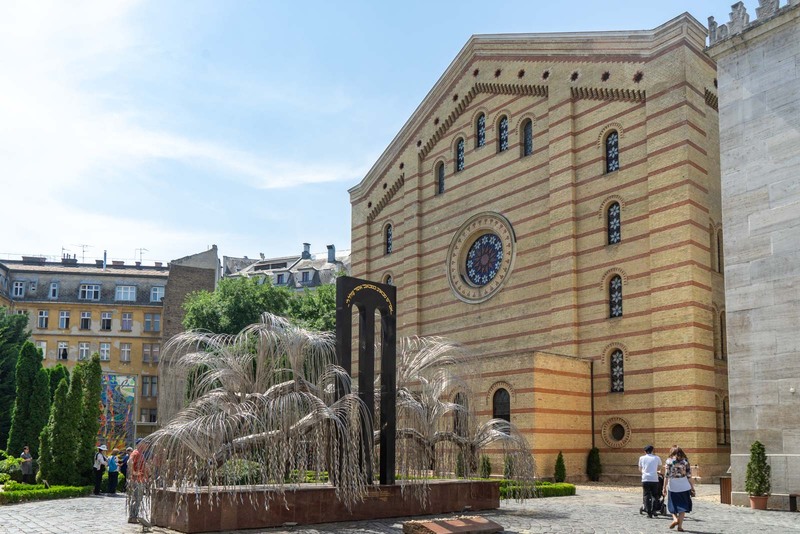 This part of Budapest’s seventh district (written as Budapest VII) began to be home for Jewish families from the end of the 18th century, after new laws made it easier for them to live in the city. Over the next 150 years, the community grew rapidly and it became a vibrant area, with synagogues, restaurants, and community centres. However, with the Second World War and the anti-semitic policies of the Nazis, tens of thousands of Jewish people were deported from their homes. This was the beginning of the decline for the district that would last for decades. For almost all of the second half of the 20th century, this area of the Jewish Quarter was a slum. The houses that had been abandoned in the 1940s were taken over by squatters who would do nothing to improve – or even maintain – them. It wasn’t until about the turn of the century that the fortunes of the Jewish Quarter in Budapest began to improve. The cheap property that the district offered was suddenly in demand by two competing groups – hipsters and developers. And so, from about 2000 onwards, some of the old abandoned buildings that had been boarded up for decades were knocked down and modern apartment blocks were built in their place. 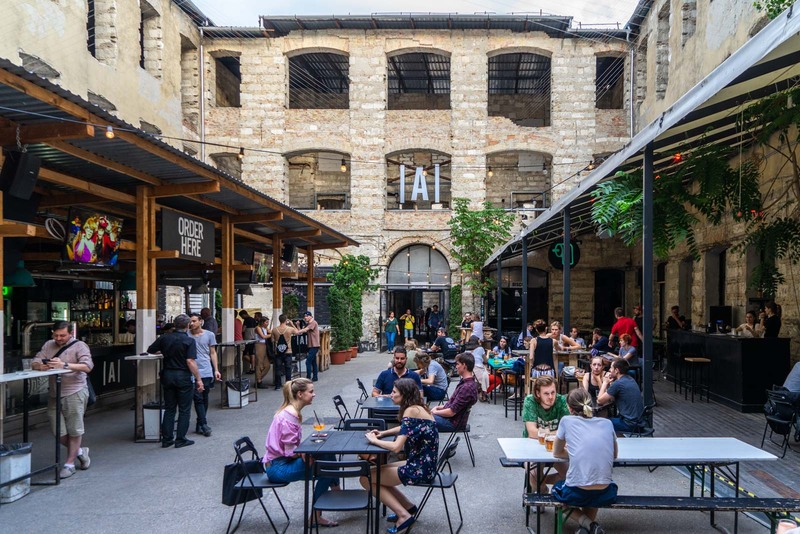 While on some other sites, the abandoned buildings were kept and the structures were used as the framework for new social spaces – and it was this movement that, much more than the generic apartment blocks, really began the transformation of the Jewish Quarter. These new sites became the famous Budapest ‘ruin bars’. I don’t think you can visit Budapest and not visit a ruin bar. They are more than just places to get a drink – they are an important part of the fabric of the modern city, transposed onto the old. 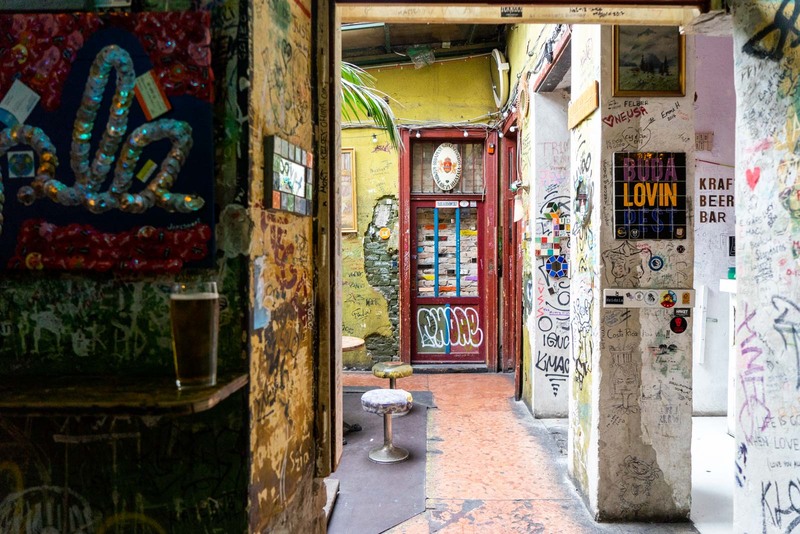 The first ruin bar to open was Szimpla Kert and it’s still the most famous. It’s on Kazinczy Street and is one of the bars mentioned in the mural that I referred to earlier. The bar is in a collection of buildings that was once a stove factory and adjacent houses. It was opened here in 2004, a couple of years after it began at a different site nearby. Going in today, you find a large open courtyard downstairs full of tables and chairs. Various rooms come off the courtyard, each with a slightly different design. Vintage furniture that look as thought it was found abandoned on the street fills these rooms, while pieces of art are placed haphazardly throughout. Upstairs there is another warren of rooms, with the walls covered in graffiti, damaged sections fixed only for safety, not aesthetics. At most of the ruin bars in Budapest, you find this style of design. Each has its own unique elements and they are certainly not identical. Some are more popular during the day, others have more of a late-night party vibe. Some are a bit upmarket, while others cater to those on a budget. I have marked on the map below what I think are the best ruin bars in the Jewish Quarter Budapest. Ultimately, the charm of the ruin bars in the Jewish Quarter come from their unpretentious local atmosphere. 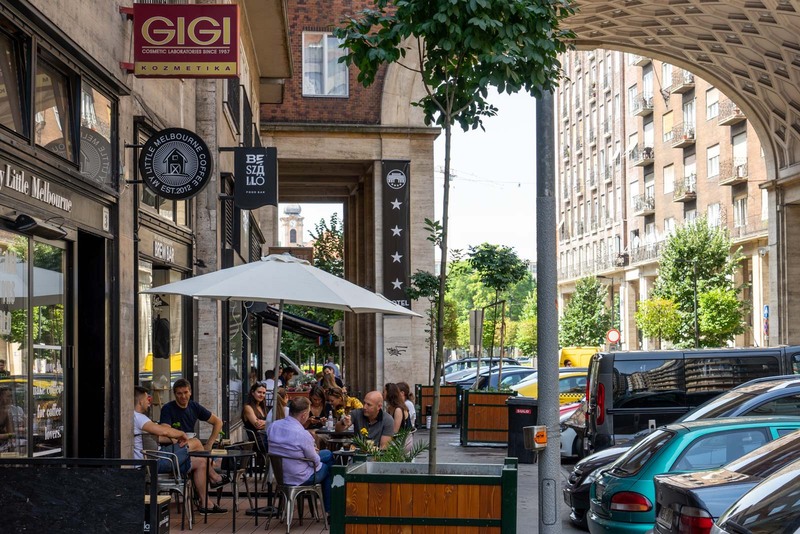 They have created cool and comfortable spaces that welcome Hungarians and tourists alike, but they have not transformed the spaces into something gratuitously modern. They have taken sites that were once vibrant – and probably still would be, if it were not for the horrors of war – and given them life again. 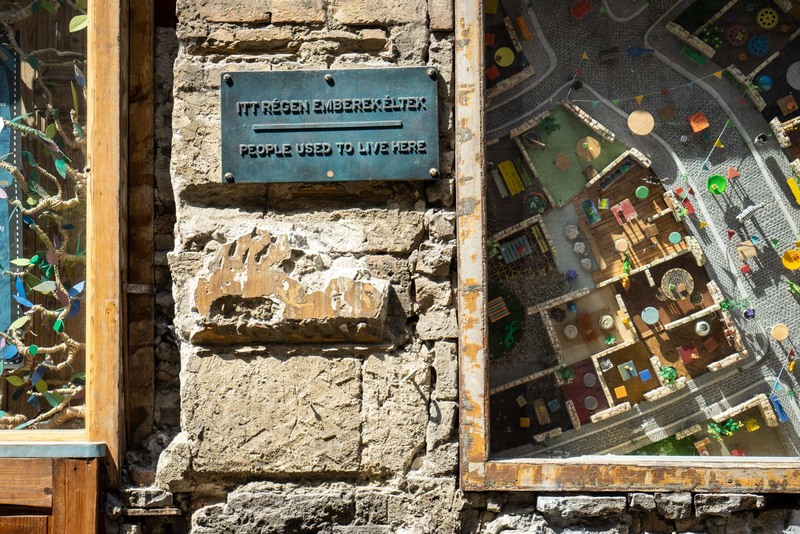 At the front of Szimpla Kert, on a wall facing the road, there is plaque that reads: “People used to live here”. It’s that message that can’t be forgotten. 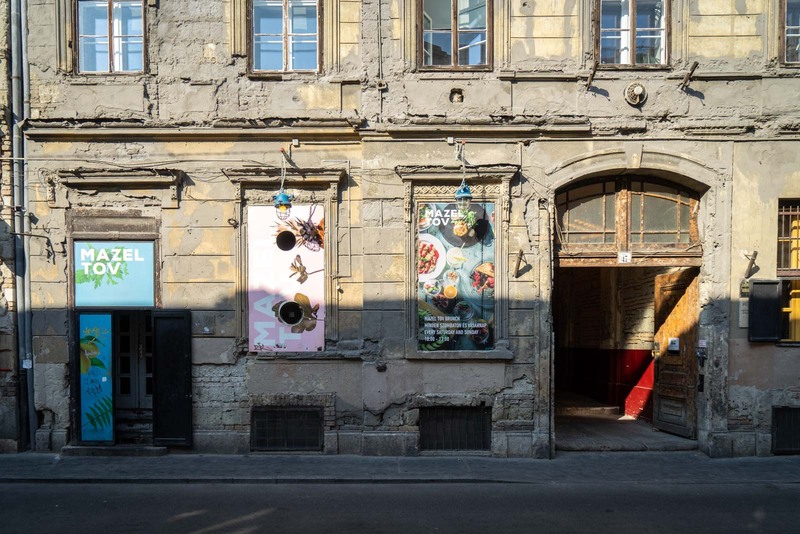 You don’t have to think too much about gentrification to see that the rise in the popularity of ruin bars led very early on to a proliferation of street art in the Jewish Quarter of Budapest. Much like we’ve seen in Shoreditch in London, when you have a concentration of cool bars and cafes, that brings in artists. When artists come in and create, then an area gets even cooler, and that brings in even more investment. 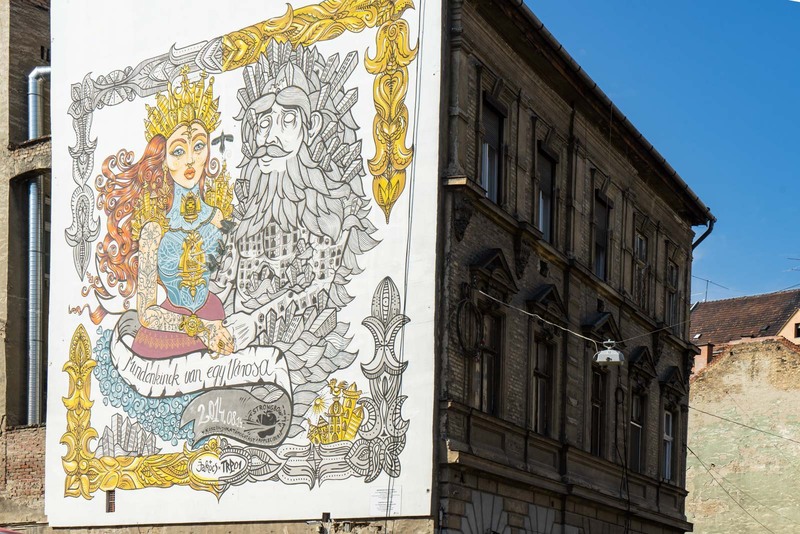 And so, amongst the busy streets of the Jewish Quarter that are now full of young locals and partying tourists, you’ll find some of the best street art in Budapest. There’s a variety of works – not just in styles but in what they represent. There are cool and modern pieces that make you smile, there are some that make a darker comment about the history of Hungary, and there are those that are deep in their message but playful in their portrayal. I take a tour of the street art in the Jewish Quarter, led by a local who is connected to the artistic community. She explains the meanings behind some of the large murals, and gives me reason to reflect on some in particular. 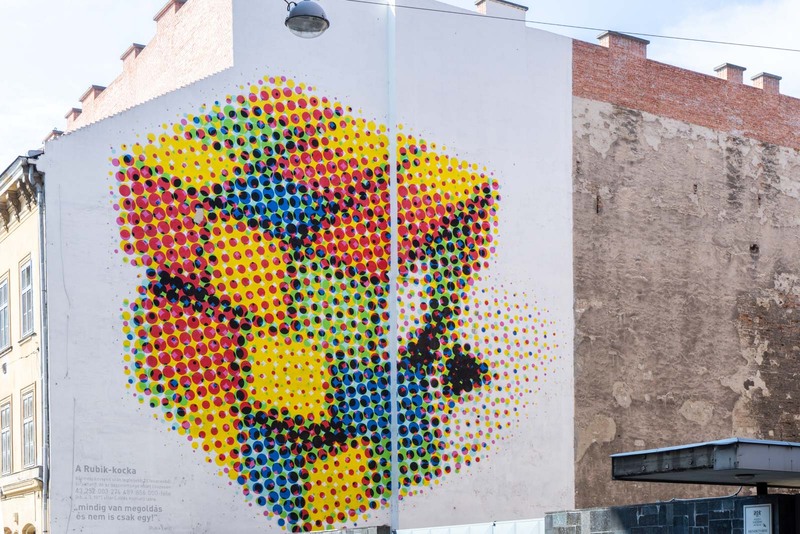 For instance, there’s the large image of the Rubik’s Cube on a white wall. It would be easy enough to see this as a tribute to one of the most famous inventions to come out of Hungary. But the guide looks at it a different way, suggesting that its message is that there’s always a solution, even if it looks impossible – and that’s been an attitude Hungarians have taken through decades of difficult politics. Even modern artworks are part of the texture of history here in Budapest. I think you get a lot more out of street art if you have a guide who can explain the context of the works and some of the history of the area. I would suggest this Urban Art Tour, or this Private Street Art Tour, or even this Art and Culture Tour. I’m spending a few days in Budapest as part of a project with wombat’s Hostels. But what really makes wombat’s a great choice is the location. 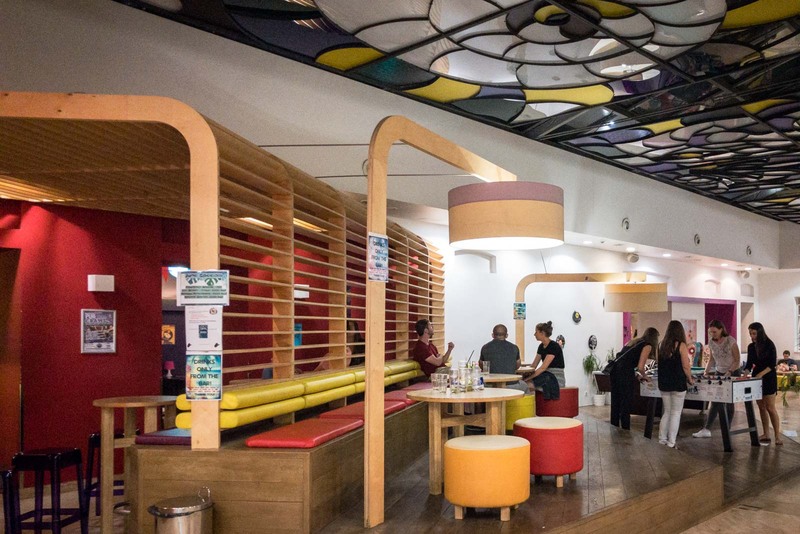 There is no doubt that when it comes to hostels in Budapest, it is in the best spot and, in fact, it probably has one of the best locations of any accommodation in the city if you want to explore the Jewish Quarter. All you have to do is step outside and you are in the middle of all the action. The ruin bars, the street art, they are all just minutes away. And, as it turns out, so are the newest and hippest cafes and restaurants. While I love the ruin bars, it’s not fair to say they are new. The first one, Szimpla Kert, opened about 15 years ago and new ones have been appearing ever since. What is a more recent trend in Budapest is for the hipster cafes that have come along with the gentrification you’ll find in big cities across the world. Although they are spread out through the Jewish Quarter, the highest concentration of these cafes and restaurants are around the Rumbach Street Synagogue, which is currently being renovated. 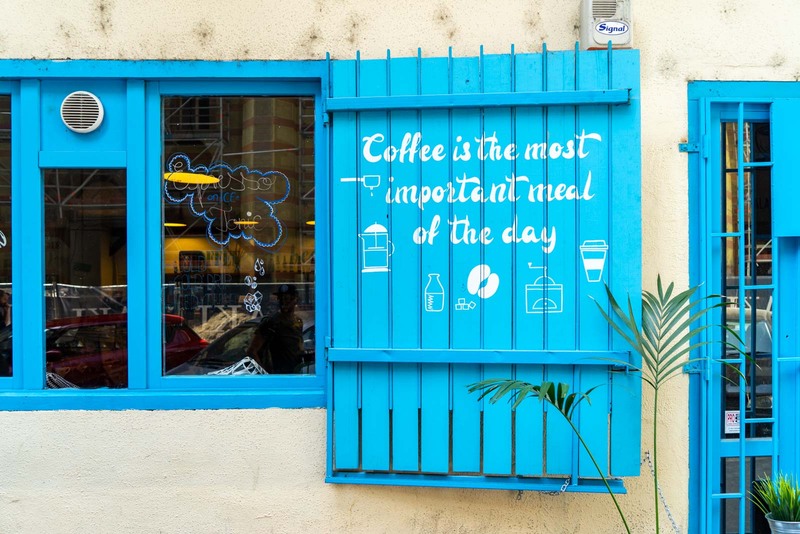 Go for a stroll down any of the streets in that area and you’ll see plenty of places to get a great coffee. If you are looking for particular recommendations, I would suggest Sonkapult, Blue Bird Cafe, and My Little Melbourne. Just as the Jewish Quarter was starting to come back to life in the years after 2000, the global financial crisis hit and that put a pause to many of the planned investments. In the last five years or so, with recovery, has come this new wave of cool places. The evolution of the Jewish Quarter has not finished yet, though. There’s still a lot of development going on and plenty of old abandoned buildings that have potential for something new. On the street art tour, our guide points out a series of large murals on the walls near a construction site. 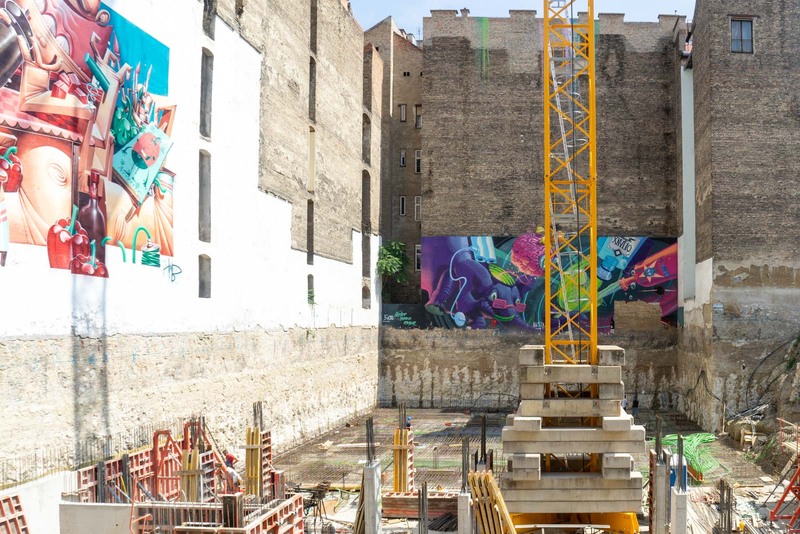 A huge apartment building is being built and, when it’s finished, it will completely hide the art. I think it’s a bit of a symbol for what’s happening here and I express my disappointment to the guide. She doesn’t seem worried, though. She explains that street art is like that – constantly changing with the environment, reflecting what is happening in the community. I guess that’s the best way to look at the Jewish Quarter here in Budapest. It’s still evolving but, most importantly, it’s full of life again. Time Travel Turtle was supported by wombat’s Hostels in partnership with iambassador but the opinions, over-written descriptions and bad jokes are his own. I never heard of a ruin bar Michael. Neat concept! Way to use what could have been trashed. Really adore small cultural pockets in this major cities too. Like a little representation of a nation or religion, or general way of life. Such a awesome place to visit! This look really fantastic post and pictures you captured in your travel trip. Thank you so much for sharing a great experiences! I missed out on the ruins bars when I was in Budapest – I ended up at a party in a pop up bar by the river which was great fun – but next time I need to check these out for sure!